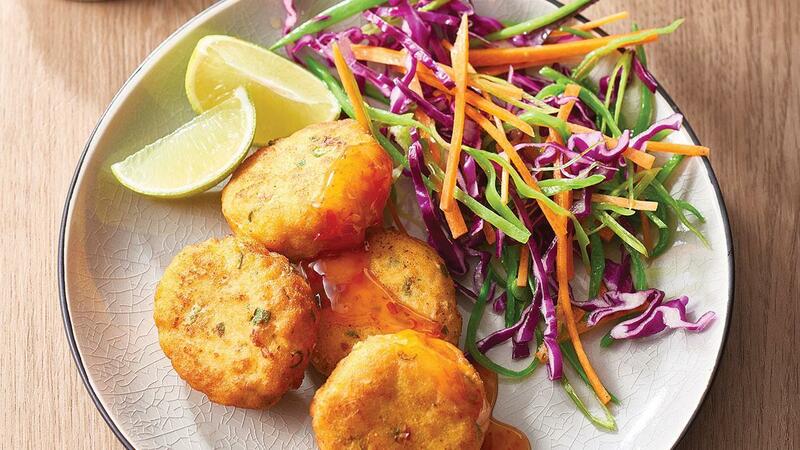 Authentic KNORR Thai Yellow Curry Paste adds great flavour to these fishcakes. Balance with a little KNORR Sakims Sweet Chili Sauce for a milder profile. Blend fish, KNORR Thai Yellow Curry Paste and KNORR Thai Sweet Chilli Sauce GF together until finely chopped. Transfer to a bowl and add egg, beans, coriander, lime juice and corn flour. Season, then mix until fully combined. Shape the mixture into discs approximately 6cm in diameter. Chill for 10 minutes. Shallow fry the fish cakes until golden. Serve with asian style slaw or steamed vegetables, rice and extra KNORR Sakims Thai Sweet Chilli Sauce.